Fish need certain types of food in their diet. A good thing to look for when looking at potential fish foods are the ingredients list and individual recommendations for each species of fish. Below is a more detailed breakdown of different types of fish food. Flakes Flakes make a good staple diet for your fish. Best for small-medium fish. Pellets Unless these are micro-pellets, pellets are designed for larger fish. Frozen foods These are slightly more expensive, but are usually used for breeding fish. Freeze dried foods Retain nutritional value as they are live ingredients freeze dried – good for your fish. Tips - Too much fat is bad for your fish - Fish like variation, try to alternate the types of food you give them each time you buy them. 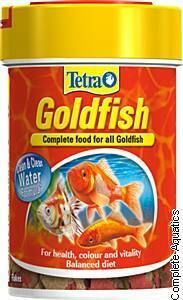 - Growth formula is suitable for baby fish and young fish who are still growing. - Herbivore flakes are for herbivorous fish. - Keep fish food refrigerated to prolong shelf life but check sell by dates and use by dates for more information over optimum fish food temperatures. Buy your fish foods and supplies from Complete Aquatics online, the one stop aquatics shop!